All the useful information that you need to know before sending money with RemitWisely! Launched in the year 2016, RemitWisely is an independent remittance service provider in Australia, which offers transfer over 150 countries around the world. It offers fast, real-time transfer services across the globe through bank transfers, SWIFT transfers, and digital wallet transfers and cash pickups. The motto of RemitWisely is to continually adapt the improvements, which will benefit the end-user and speed-up the flow of finances globally. The company is a subsidiary of MK Financial and has its head office in Melbourne, Australia. Anyone who is above the age of 18 years can apply for its account and send money internationally. One can send a minimum amount of AUD 100 and maximum of AUD 8,000 in a day. If you want to send a larger amount than its maximum limit, you need to contact the company for seeking permission. The company is regulated by AUSTRAC which makes it highly secure and is highly secured. It offers live chat option 24*7 and also fill its contact form to get the callback. To fill the callback form of RemitWisely, click here. So, on an overall basis, we rate it 8.5 out of 10. Pricing : How much does RemitWisely cost? The company charges fees on every transfer no matter how small or large the amount is. So, you have to pay fees which lay in-between $2 to $20 depending on which country you are sending funds to. The company keeps changing the exchange rates as per market fluctuations and the type of transfer you choose. If you choose the instant transfer, then you will get the live market rate, which is protected from the fluctuations. In the bank account transfer, the exchange rate applied will be of the date on which the transfer completes. The company does not charge any other fee, but there is no assurance if the receiving bank will charge any fee or not. So before transferring funds, you should check with the bank regarding its charges for converting foreign currency into local currency. For its pricing policy, we rate RemitWisely 8 out of 10 because it changes the exchange rate when you transfer funds through the bank account. Transparency: Does RemitWisely have any hidden fees? The company is not charging any hidden fees from the customers. The amount which is sent by the user will be received by the beneficiary. You can track the transfer by logging into your account at the dashboard. There is no direct tracking procedure available. So under the transparency head, we rate RemitWisely 9 out of 10 because it is not providing direct tracking number and link to track the transfer. Transfer Speed: How long does it take to send money through RemitWisely? Bank Transfer: It takes approximately 2-3 days to receive money to the beneficiary. SWIFT Transfer: This is the fastest way to transfer funds, where it can be received by the recipient within 10 minutes to 24 hours. Cash Pickup: This may take 24 hours or more to receive the funds to recipient depending on the working hours of the country. Digital Wallet: This is a real-time transfer and amount will be received by the recipient instantly. Under transfer speed head, experts of Exchange Rate IQ provides 10 out of 10 because it has multiple options, so one can send funds for an emergency with high transfer fees within seconds and use other options with low transfer fees where amount will receive late. Security : Is RemitWisely Safe? The company is highly secured as it is fully regulated by the Australian Securities and Investments Commission (ASIC) and by the Australian Transaction Reports and Analysis Centre (AUSTRAC). At the same time it has a special application approval process, so if you are opening the account, you need to get the approval first. So, under this head, we rate it 10 out of 10. Better exchange rates compared to banks. Fee applies to all the transfers. The company has not come up with the mobile apps yet which is a major drawback of it. The company offers multiple benefits of referring its services to the friends and family. If they transfer funds using your referral link then you will get such benefits. The company offers promo codes through email, SMS and notifications to the users which will help them to send funds at lower transfer fee. So, on overall user experience, we rate it 7.5 out of 10, because it has no mobile apps. If you want to use the services of RemitWisely Log in here. Coverage: How many Countries & Currencies does RemitWisely support? 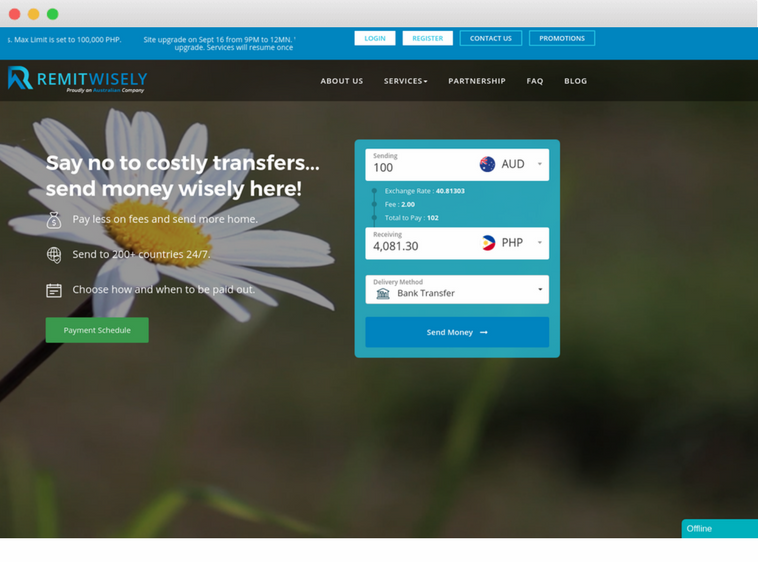 So, the company is providing remittance services from Australia to many countries, still it has to cover many countries and currencies to become the top remittance service provider in Australia. Hence, we rate it 7 out of 10 under the coverage head. If you want to use the services of RemitWisely sign up here. Go to the RemitWisely website. Select the country to which you want to send funds and it will show you the exchange rate along with transfer fee. If you are satisfied with the rate and fee, click on register. Here enter all the details as asked by the company to complete your account. Enter the bank details. You will be registered within 15 minutes by the team of Remit Wisely. Now enter details of the recipient. Enter the amount and the type of transfer you want. Re-check all the details and submit it. Further, you can track your transaction at the dashboard.